It's a visually-stunning and well-acted film that is definitely worth seeing in 3D. Sometimes it's difficult to watch animals sufffer, even when they are CGI. Before Ang Lee (Crouching Tiger, Hidden Dragon) signed on to direct Life of Pi, the film based on Yann Martel’s 2001 fantasy novel by the same name, a few other notable directors came and went. First, it was M. Night Shyamalan (The Sixth Sense), followed by Alfonso Cuarón (Children of Men). And then there was Jean-Pierre Jeunet (Amelie). While the book has been said to be un-filmable, Lee and Finding Neverland screenwriter David Magee successfully weave a coherent narrative out of it and accurately capture the novel’s theme of faith and self-discovery. The film portends to be an art house hit, and it doesn’t overemphasize the visual at the expense of the storyline. The plot centers on Pi Patel (Suraj Sharma), a young Indian boy who ends up on a Japanese freighter headed to Canada after his parents decide to move themselves and the exotic animals in their zoo out of India. When the boat sinks in a horrible storm, Pi ends up on a lifeboat with a few of the animals. Soon, the only survivor other than Pi is a fierce Bengal tiger named Richard Parker. The two encounter a number of life-threatening obstacles during their long journey across the Pacific Ocean. One day, they’re overcome by a school of flying fish. Another day, a giant whale practically capsizes their boat. Lee makes the most of the 3-D special effects; at times, he depicts the surrounding ocean and night sky in a wondrous glow. And the storms that Pi must endure become swirling maelstroms of awe-inspiring power as lightening flickers violently across the sky and gigantic waves display their incredible power. 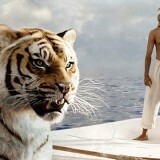 Visually stunning, the movie also has real heart, thanks, in part, to lead actor Sharma. Sharma portrays the young Pi as a sometimes-rash young man whose survival instincts sharpen as the story progresses, and Irrfan Khan, who plays Pi as an adult and narrates the story, is equally terrific. At 127 minutes, the movie is a major commitment. But the surprise ending makes this story about storytelling and faith all worthwhile.